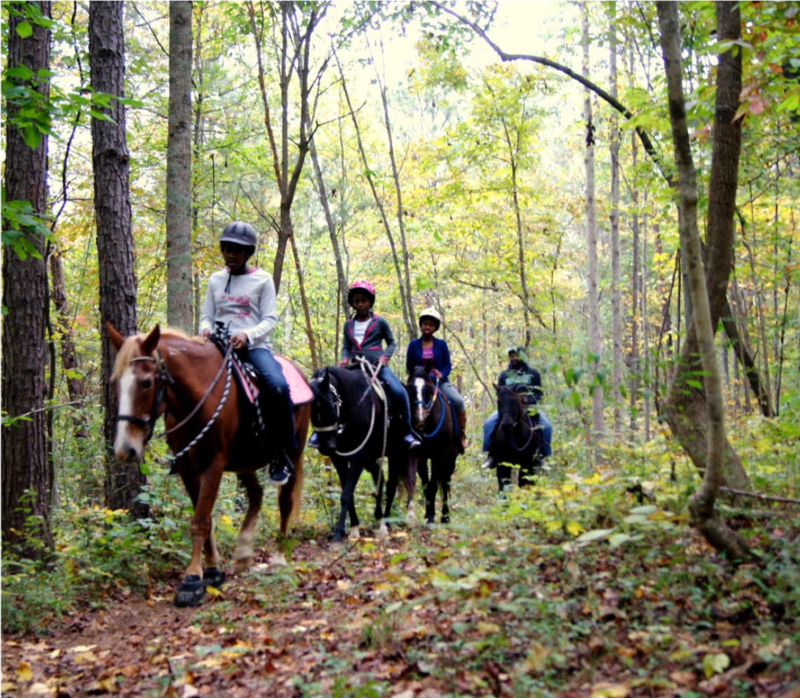 Hidden Hills offers guided trail rides for individuals or small groups. Most horseback rides are about an hour long and meander through beautiful open fields and pastures and along the wooded trails of historic Grindstone Mountain. Trail riding is the perfect activity for special occasions (vacations, birthdays, dates, and even proposals! ), group events (youth groups or family get-togethers) or a chance just to get away from it all. Trail rides are offered year round Sunday-Friday, between 11am and 6pm, by appointment only. From May to September, we also offer Firefly Rides starting around 7pm to enjoy the cooler temperatures and magic of the evening ($50/person). In case of uncertain weather, Hidden Hills generally keeps scheduled appointments unless there is lightning or a non-stop rain. It is the client’s responsibility to cancel within 4 hours of of the trail ride. If it is below 40 degrees, horseback riding is generally quite uncomfortable and Hidden Hills recommends rescheduling for another time, but again, it is the client's responsibility to reschedule. There is a 24 hour cancellation policy. Trail rides that cancel within 24 hours of the scheduled ride may be charged the full amount of the ride (except in the case of inclement weather). Call or text 423-488-3993 or email info@hiddenhillsfarm.com to schedule your horseback ride. Please have a credit card ready to hold your ride (cash is preferred at the time of the trail ride–credit cards will be charged an extra $2/rider). Closed-toe shoes and long pants are REQUIRED. All trail riders are required to wear an ASTM certified riding helmet that we provide. You may bring your own horseback riding helmet; no bike helmets, please. To save time at the barn, sign the Release and Waiver of Liability widget below before you come. You can also bring a completed Release and Waiver of Liability Agreement PDF to your ride if you'd prefer.